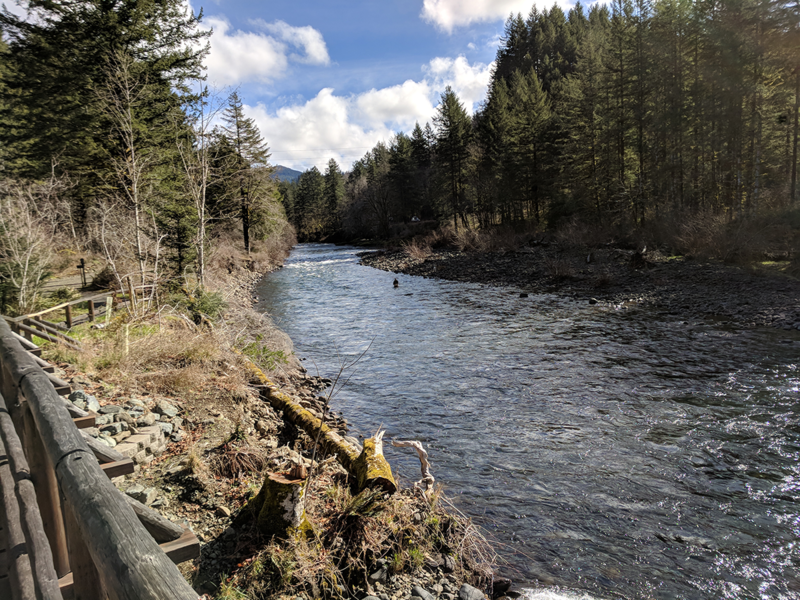 April events at the Tillamook Forest Center | Gales Creek Journal | Serving the communities of Gales Creek, Glenwood, and Hillside. April 6 & 7 (Sat & Sun) 11:30 a.m. & 1:30 p.m.
Staff will guide each participant to a tree planting site and provide native tree seedlings for planing in the Tillamook State Forest. Participants will receive a tree planting certificate. The event is rain or shine so please be prepared to spend a half hour tree planting, to wear sturdy, comfortable shoes because the planting will occur on uneven ground, and to dress in layers because temperatures in the forest tend to be 10 degrees cooler than surrounding areas. There also will be family activities and special exhibits available throughout the day. Attendees will be able to create tree arts and crafts, try their hand at a tree scavenger hunt to win a prize, and much more. It’s guaranteed to be a tree-mendous time. Registration and fees are required for large groups of 10 or more and the deadline to sign up is Wednesday, April 3. To register or for more information call 503-815-6803 or send email to luke.c.wahl@oregon.gov with the names of all attending. April 13 & 14 (Sat & Sun) 11:30 a.m. & 1:30 p.m. Visitors will be submerged into the world of steelhead and salmon in the Tillamook State Forest. Salmon and Steelhead live in the cool, clear rivers that run throughout the Coast Range. Join us to explore life cycles, habitats, and the underwater oasis where these dynamic fish live. After a short presentation guests will walk to the Wilson River and release fish that were raised in the visitor center fish tank. Please note these are estimated dates. For more information call 503-815-6803. April 20 (Sat) 11:00 a.m. The Oregon Department of Forestry presents another Fresh Brewed Forestry presentation where scientists will show guests a behind-the-scenes look at how forests are managed. Presentations are scheduled once a month in the spring and fall on Saturdays at 11:00 a.m., and coffee and tea will be provided. Biomass resource specialist Marcus Kauffman will shre stories of the people, policies and potential of using biomass from Oregon’s forests in a carbon-constrained world. Regsitration is open. Please send email to luke.c.wahl@oregon.gov with the names of all people attending. April 27 (Sat) 11:00 a.m. The public is welcome to meet and greet the featured artist behind the Forest Floor to Gallery exhibit, including listening to stories about his sculptures and watching a woodworking demonstration to get a sneek peak ata how he brings new life to old logs. April 27 & 28 (Sat & Sun) 1:30 p.m.
Naturalists will share some of the beautiful wildflowers found in the forest now that spring has sprung. Come along for an easy, guided walk to look for trilliums, wood violets, candy flowers, sour grass, and much more. April 28 (Sun) 1:00 p.m. Learn how to design playful and interesting compositions for your sketchbook, including exploring drawing butterflies and botanicals using creative approaches. Investigate butterfly and plant structures and experiment with various techniques using pencil, pens, and colored pencils. Supplies will be provided, but please feel free to bring your own. The workshop is for ages 12 to adult and space is limited. Registration is required by Wednesday, April 24. Please call 503-815-6800, stop by the forest center to reserve your space, or send email to luke.c.wahl@oregon.gov with the names of all attending. The Tillamook Forest Center, an ODF-managed facility located in the heart of the Tillamook State Forest along Highway 6 will play host to thousands of visitors in 2019 who visit the Tillamook State Forest, either passing through on the way to the Oregon Coast, or for some, visiting the forest for what it has to offer, such as trails, rivers, off-road opportunities, foraging, fishing, hunting, and more. The center features a replica fire lookout tower, an interpretive center, a bridge that spans the Wilson River and links to the Wilson River Trail, a theater that shows programs related to the historic Tillamook Burn, and presentations surrounding the history, wildlife, and vegetation of the Tillamook State Forest. With a suggested donation of $5, visitors can find the center open in the spring Wednesday through Sunday from 10 a.m. to 4 p.m.
More information can be found by visiting the Tillamook Forest Center website.